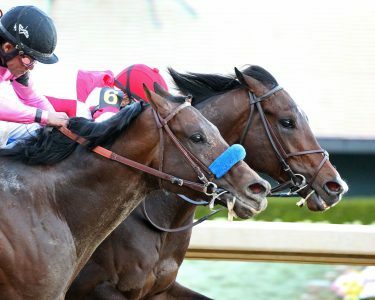 All the latest happenings on the Road to the Kentucky Derby, including what Kentucky Derby preps the top contenders are pointing for. Grade 2 Blue Grass Stakes winner Vekoma returned to his winter base at Palm Beach Downs in Florida, where George Weaver’s charge will do the majority of his training ahead of the Grade 1 Kentucky Derby on May 4. Weaver said he is hopeful that Javier Castellano, who rode Vekomoa in the Blue Grass Stakes, will accept the mount for the Kentucky Derby and that previous rider Manny Franco will likely be the alternative should Castellano opt for another entrant. Blue Grass Stakes fourth-place finisher Somelikeithotbrown exited the race with a chip in a hind ankle and is off the Triple Crown trail. Trainer Mark Henning said the Grade 3 Peter Pan Stakes on May 11 at Belmont Park and the Grade 1 Preakness Stakes at Pimlico on May 18 are options for Grade 1 Florida Derby fourth-place runner Bourbon War if his 31 Kentucky Derby qualifying points do not earn him a spot to run for the roses. Nolo Contesto, the fourth-place runner in the Grade 1 Santa Anita Derby, will aim for major summer stakes like Saratoga’s Grade 1 Travers Stakes and Monmouth Park’s Grade 1 Haskell Invitational. Multiple graded stakes victor Mucho Gusto is under consideration for the Grade 3 Pat Day Mile on the Kentucky Derby undercard. Conditioner Greg Sacco said he had no immediate plans for late Triple Crown nominee Joevia, who was disqualified from seventh to last for interference in Aqueduct’s Grade 2 Wood Memorial, but the colt could return in about six weeks. Sacco said Mind Control exited his Grade 3 Bay Shore Stakes score on the Wood Memorial undercard in good shape and will race next in the Grade 1 Woody Stephens Stakes on June 8, Belmont Stakes Day, at Belmont Park. Extra Hope, who completed the superfecta in a division of the Grade 2 Rebel Stakes at Oaklawn Park last month, has been taken out of training due to bone bruising and sent to a layup facility to recover. The European Road to the Kentucky Derby is unlikely to produce a starter for the Run for the Roses after non-Triple Crown nominee Bye Bye Hong Kong captured the final event in the series, the Woodford Reserve Cardinal Conditions Stakes at Chelmsford City on April 11, and none of the top three on the leaderboard behind him are nominated to the U.S. classics. Trainer Bob Baffert reported that his one-two finishers in the April 6 Grade 1 Santa Anita Derby, Roadster and Game Winner, were doing well a day later and plans are to be determined for shipping them to Churchill Downs for the Grade 1 Kentucky Derby on May 4. Instagrand, who set the pace before being passed by the Baffert duo in the Santa Anita Derby, remains under consideration for the Kentucky Derby, as well as the Grade 3 Pat Day Mile on the undercard. Grade 2 Blue Grass Stakes victor Vekoma exited his April 6 score in good shape and will remain at Keeneland, where trainer George Weaver plans to have him walk the shedrow for several days before resuming training. Blue Grass Stakes runner-up Win Win Win was scheduled to return to his home base at Fair Hill Training Center in Maryland on April 8 and will train there until shipping to Churchill Downs a week before the Kentucky Derby. Blue Grass Stakes show finisher Signalman will remain at Keeneland for another week or two and most likely have his final work for the Kentucky Derby at Churchill Downs. Somelikeithotbrown co-owner Jimmy Shircliff said he and his partners will probably run their Blue Grass Stakes fourth-place finisher in the Kentucky Derby if his 30 qualifying points are enough to get into the gate. Tacitus and Tax, who completed the exacta in Aqueduct’s Grade 2 Wood Memorial on April 6, exited their efforts fine and will be prepared to run for the roses. Wood Memorial third-place finisher Haikal came out of the race with no issues, and conditioner Kiaran McLaughlin said his charge will more than likely ship to Louisville for the Kentucky Derby. The connections of Japan Road to the Kentucky Derby competitor Master Fencer have accepted an invitation to participate in the Kentucky Derby. If he starts in the race, Master Fencer will become the first Japanese-bred colt to run in the Kentucky Derby. Trainer Peter Miller confirmed that Grade 2 UAE Derby runner-up Gray Magician is being pointed at the Kentucky Derby. Gray Magician will complete his preparations for the Kentucky Derby at the San Luis Rey Training Center in California and ship to Churchill Downs the week of the race. Conditioner Todd Pletcher said Grade 2 Louisiana Derby second-place finisher Spinoff and Grade 3 Sunland Derby winner Cutting Humor will train up to the Kentucky Derby at Palm Beach Downs in South Florida. If Grade 1 Florida Derby runner-up Bodexpress competes in the Kentucky Derby, he will attempt to join Buchanan (1884), Sir Barton (1919) and Brokers Tip (1933) as the only horses to win the race as maidens. Code of Honor, the Grade 2 Fountain of Youth winner and third-place finisher in the Florida Derby, has settled in at Shug McGaughey’s Keeneland barn and will have at least one work there before moving over to Churchill Downs if McGaughey and owner Will Farish decide to run him in the Kentucky Derby. California-based runners Omaha Beach, Improbable and Galilean will ship to Oaklawn Park on April 9 for the Grade 1 Arkansas Derby on Saturday. Trainer Jerry Hollendorfer is considering removing blinkers from Galilean for the Arkansas Derby. Conditioner Bill Mott confirmed that Joel Rosario will have the mount on Country House in the Arkansas Derby. Sunland Derby runner-up Anothertwistafate arrived at Keeneland on April 5 and is expected to run in that track’s Grade 3 Lexington Stakes on April 13 in an attempt to add to his 30 Kentucky Derby qualifying points and secure a spot in the gate on the first Saturday in May. Others expected to run in the Lexington Stakes are Award Winner, Chase the Ghost, Durkin’s Call, Harvey Wallbanger, Owendale, Skywire, Sueno and Zenden. Knicks Go and Roiland are under consideration for the Lexington Stakes. Florida Derby fifth-place runner Current will likely return to turf and may target the Grade 1 Belmont Derby at Belmont Park on July 6. After capturing Keeneland’s Grade 3 Transylvania Stakes on April 5, Avie’s Flatter is a candidate for the Grade 2 American Turf Stakes at Churchill Downs on Kentucky Derby day. Churchill Downs announced that Grade 2 Wood Memorial entrants Grumps Little Tots, Hoffa’s Union and Joevia plus allowance winner Spun to Run were the only late nominees to the Triple Crown by the April 1 deadline. Hoffa’s Union became a surprise entrant to the April 6 Wood Memorial after it became apparent that the gelding would be excluded from a planned run in Keeneland’s Grade 2 Blue Grass Stakes on the same day due to insufficient earnings. Conditioner Bob Baffert did not enter Dessman in the Wood Memorial as expected because he deemed the colt’s final work as unsatisfactory. Extra Hope was not entered for the April 6 Grade 1 Santa Anita Derby so that the colt can undergo a precautionary physical, which trainer Richard Mandella believes will find that his charge is muscle sore. The Maryland-bred Alwaysmining, a winner of five consecutive races at Laurel Park, will stay there for his next start and race in the April 20 Federico Tesio Stakes, a “Win and You’re In” contest for the May 18 Grade 1 Preakness Stakes at Pimlico. Grade 2 UAE Derby hero Plus Que Parfait returned to the Meydan track April 4 to gallop and will remain in light training there until he heads back to the U.S. and Churchill Downs next week. Trainer Blaine Wright said that Grade 3 Sunland Derby runner-up Anothertwistafate will likely work over the New Mexico track this week while his connections watch the Grade 1 Kentucky Derby leaderboard to determine if he needs a final prep to earn additional qualifying points. Conditioner Jason Servis plans to prepare Grade 1 Florida Derby champ Maximum Security at the Palm Meadows Training Center in South Florida for a likely start in the Grade 1 Kentucky Derby on May 4. Trainer Gustavo Delgado said Florida Derby runner-up Bodexpress will have two workouts at Gulfstream Park West before shipping to Churchill Downs the week of the Kentucky Derby. Conditioner Shug McGaughey said he has yet to determine Kentucky Derby plans for Florida Derby show finisher Code of Honor. Trainer Mark Hennig reported that Florida Derby fourth-place finisher Bourbon War exited the race in good shape, and he hopes the 31 qualifying points his charge has will be enough to secure a spot in the starting gate to run for the roses. Beaten Florida Derby favorite Hidden Scroll is most likely to shorten up in distance and possibly target an allowance contest for his next start. Grade 2 UAE Derby hero Plus Que Parfait will not return to the U.S. from Dubai until Monday, April 8, and will then travel to Kentucky to begin preparing for the Run for the Roses. Peter Miller, conditioner of UAE Derby runner-up Gray Magician, said it is not likely that his colt will run in the Kentucky Derby but did not rule it out. Multiple stakes-placed Joevia, who was not an early nominee to the Triple Crown, will make his graded stakes debut in Aqueduct’s Grade 2 Wood Memorial on April 6. Other horses probable for the Wood Memorial are Tacitus, Outshine, Haikal, Tax, Final Jeopardy, Grumps Little Tots, Not That Brady, Overdeliver and Dessman. Jockey Victor Espinoza has been confirmed to ride trainer Bob Baffert’s Dessman in the Wood Memorial and Much Better in the Grade 3 Bay Shore Stakes earlier in the card. Conditioner George Papaprodromou plans to run Grade 2 San Vicente Stakes fourth-place runner Synthesis, a recent private purchase by Kratz Racing, John Decker and Jay Selby, in the Grade 1 Santa Anita Derby on April 6 at Santa Anita Park. Others expected to enter the Santa Anita Derby are Game Winner, Instagrand, Extra Hope, Roadster and Nolo Contesto, with Sparky Ville possible for the race. Grade 2 Louisiana Derby show finisher Sueno settled in at Keith Desormeaux’s barn 24 at Churchill Downs to begin training for a possible start in Keeneland’s Grade 3 Lexington Stakes on April 13. After extensive testing for his injury suffered a few strides out of the gate in the Grade 2 Louisiana Derby revealed no further problems, multiple stakes winner War of Will resumed training at Keeneland. Mind Control, second last out in Aqueduct’s Grade 3 Gotham Stakes, has been taken off the Triple Crown trail to stay in one-turn races and will run in the Bay Shore Stakes. Knicks Go, winner of last fall’s Grade 1 Claiborne Breeders’ Futurity, is a candidate for Keeneland’s Grade 3 Lexington Stakes on April 13. Mr Money Bags, who captured consecutive stakes at Sam Houston by a combined 18 1/2 lengths, is being pointed to the Grade 3 Pat Day Mile on the Kentucky Derby undercard. Epic Dreamer, who finished ninth in the Grade 2 Fountain of Youth Stakes at Gulfstream Park, is being given time off and will be aimed at a summer campaign. Grade 2 Louisiana Derby winner By My Standards became the first 2019 Grade 1 Kentucky Derby contender to arrive at Churchill Downs when he settled into barn 23 on March 27. Grade 3 Sunland Derby runner-up Anothertwistafate has remained at Sunland Park since his March 24 effort after a quarantine was placed on one of the barns of his trainer, Blaine Wright, at Golden Gate Fields due to death of a horse who tested positive for the highly contagious disease equine herpesvirus. Wright said Anothertwistafate will remain in light training at Sunland Park as he monitors the Kentucky Derby leaderboard to decide whether his charge needs to try to earn additional qualifying points in one of the final prep races. Grade 1 Florida Derby morning line favorite Hidden Scroll schooled at the Gulfstream Park gate on March 28 for Hall of Fame conditioner Bill Mott. Grade 3 Gotham Stakes show finisher Instagrand is likely to have his final Kentucky Derby prep in Santa Anita’s Grade 1 Santa Anita Derby on April 6 with Flavien Prat taking over the mount while Javier Castellano rides Vekoma in Keeneland’s Grade 2 Blue Grass Stakes the same day. 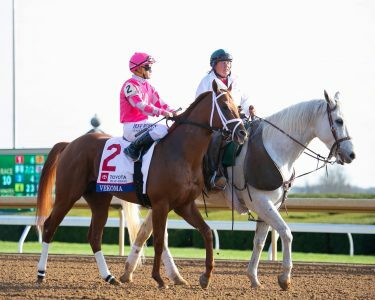 In addition to Vekoma, Keeneland’s racing office listed the following as probable for the Blue Grass Stakes: Admire, Chase the Ghost, Chess Chief, Dream Maker, Hoffa’s Union, Lucky Lee, Market King, Mr. Ankeny, Signalman, Sir Winston, So Alive and Somelikeithotbrown. Conditioner Todd Pletcher’s Soldado is a candidate for the Blue Grass Stakes off his show finish in a March 3 Gulfstream Park allowance optional claiming event. Trainer Mark Casse’s Our Braintrust remains under consideration for the Blue Grass Stakes as he recovers from an ankle gash suffered in a division of Oaklawn Park’s Grade 2 Rebel Stakes on March 16. Jose Ortiz will take over from Drayden Van Dyke as the rider on Rebel Stakes division second-place finisher Improbable when the colt makes his last start before the Run for the Roses in Oaklawn Park’s Grade 1 Arkansas Derby on April 13. Conditioner William “Jinks” Fires said Stewart Elliott is likely to be aboard multiple stakes winner Gray Attempt in the Arkansas Derby since his last-race jockey, Jon Court, is expected to ride Rebel Stakes division victor Long Range Toddy in that race. Trainer Richard Mandella confirmed that Omaha Beach, the winner of the other division of the Rebel Stakes, will return to Oaklawn Park for the Arkansas Derby with Mike Smith again in the irons. Galilean, beaten two and a half lengths by Long Range Toddy in the Rebel Stakes, is being aimed for a rematch with that rival in the Arkansas Derby. Mandella’s Extra Hope, who was fourth behind Long Range Toddy in the Rebel Stakes, is being pointed to the Santa Anita Derby with Drayden Van Dyke confirmed to ride. Pletcher’s Overdeliver, who had been considered for the Florida Derby, is likely to make his next start in either Aqueduct’s Grade 2 Wood Memorial on April 6 or the Grade 3 Bay Shore Stakes on that undercard. Trainer Josie Carrol said Avie’s Flatter, the favorite to win Canada’s Sovereign Award for top two-year-old male, will make his seasonal debut in Keeneland’s grassy Grade 3 Transylvania Stakes on April 5. The Japan Road to the Kentucky Derby will conclude March 31 with the running of the Fukuryu Stakes at Nakayama slated for a post time of 1:50 a.m. ET. Big Brown winning the 2008 Kentucky Derby. Trainer Bret Calhoun, who will have his first starter in the Grade 1 Kentucky Derby if Grade 2 Louisiana Derby champ By My Standards runs for the roses, said his charge exited the March 23 effort in good order and will ship to his Churchill Downs barn on March 26, arrive the following day and train there up to the May 4 race. Spinoff, second to By My Standards in the Louisiana Derby, headed back to conditioner Todd Pletcher’s base at Palm Beach Downs on March 25 and will likely train up to the Kentucky Derby. Louisiana Derby fourth-place runner Country House could use the Grade 1 Arkansas Derby on April 13 at Oaklawn Park as his final prep for the Kentucky Derby. Louisiana Derby beaten favorite War of Will is believed to have suffered a strained right hind muscle during his ninth-place run in the race, and his status for the Kentucky Derby remains uncertain as his connections monitor his improvement. Trainer Mark Casse said War of Will will ship to Keeneland on March 26 with his main string of horses and could resume training soon. Pletcher’s Cutting Humor posted a track-record of 1:46.94, bettering the old mark of 1:47.21 set by Oh So Regal in the Sunland Park Handicap on April 15, 2018, when he scored at the New Mexico oval in the Grade 3 Sunland Derby on March 24. Cutting Humor will return to his South Florida base on March 27, and Pletcher will confer with owner Starlight Racing before determining his plans. Conditioner Ralph Nicks confirmed multiple stakes winner Garter and Tie for Gulfstream Park’s Grade 1 Florida Derby on March 30 and said his charge will be kept inside with the pony rather than going into the walking ring before the race. Garter and Tie will race without blinkers for the first time in the Florida Derby after working without the equipment on March 23. Overdeliver, second in Tampa Bay Downs’ January 19 Pasco Stakes last out, is under consideration for the Florida Derby and will be ridden by Manny Franco if he starts in the $1 million contest. Vekoma, who suffered his first defeat when third in Gulfstream Park’s Grade 2 Fountain of Youth Stakes on March 2, will skip the Florida Derby and race next in Keeneland’s Grade 2 Blue Grass Stakes on April 6. With regular jockey Franco having commitments the same day on Aqueduct’s Wood Memorial card, Javier Castellano will be aboard Vekoma in the Blue Grass Stakes. 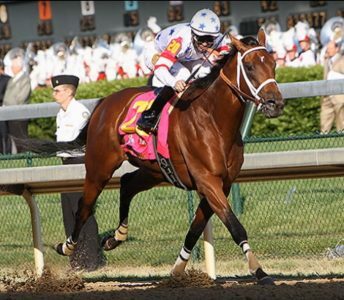 Romping Laurel Park maiden winner Hoffa’s Union will also bypass the Florida Derby in favor of the Blue Grass Stakes. Grade 3 Withers Stakes show finisher Our Braintrust exited his last place run in Oaklawn Park’s second division of the Grade 2 Rebel Stakes with a gash in his ankle but recovered quickly and is a candidate for the Blue Grass Stakes. Multiple stakes winner Gray Attempt remains on track for the Arkansas Derby after wiring the field in Oaklawn Park’s March 23 six-furlong Gazebo Stakes. Omaha Beach, who won one of the two divisions of the Grade 2 Rebel Stakes at Oaklawn Park on March 16, will return to the track for the Arkansas Derby with Mike Smith slated to retain the mount. Omaha Beach’s stablemate, Extra Hope, who was ridden by Smith to a fourth-place effort in the other division of the Rebel Stakes, will be pointed for the Grade 1 Santa Anita Derby on April 6 and have Drayden Van Dyke in the irons. Grade 3 Sham Stakes hero Gunmetal Gray is sidelined for the year after having surgery to repair a condylar fracture suffered during a March 24 workout at Santa Anita. 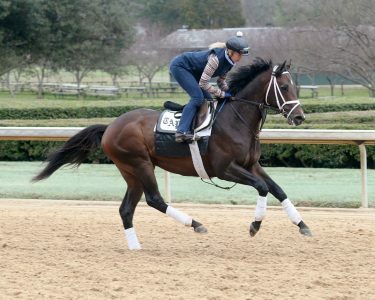 Long Range Toddy (photo via Oaklawn Park). Grade 2 Risen Star Stakes runner-up Country House, who lugged in badly down the lane in that effort, will be equipped with a Haughton bit to help jockey Luis Saez guide him better in the March 23 Grade 2 Louisiana Derby at Fair Grounds. Probables for the Grade 2 UAE Derby on March 30 at Meydan Racecourse in Dubai filly Divine Image, Derma Louvre, Estihdaaf, Golden Jaguar, Gray Magician, Jahbath, Manguzi, Plus Que Parfait, Stubbins, Superior, Swift Rose, Van Beethoven, Walking Thunder and 4-year-old Grecko. Gulfstream Park racing officials have confirmed Bourbon War, Code of Honor, Harvey Wallbanger, Hidden Scroll, Hoffa’s Union, Maximum Security and Vekoma for the Grade 1 Florida Derby on March 30. Grade 2 Holy Bull Stakes hero Harvey Wallbanger is expected to complete his Florida Derby preparations for the with a half-mile blowout over that course on March 23. Harvey Wallbanger is scheduled to ship to Kentucky on April 2 along with stablemate Signalman, who is slated to race next in Keeneland’s Grade 2 Blue Grass Stakes on April 6. In addition to the Blue Grass Stakes, owners Gregory and Caroline Bentley and trainer Kelly Rubley are considering Aqueduct’s Grade 2 Wood Memorial on the same day and Laurel Park’s Federico Tesio Stakes on April 20 as the next start for multiple stakes winner Alwaysmining. Grade 2 Rebel Stakes show finisher Market King is under consideration for the Blue Grass Stakes and the April 13 Grade 1 Arkansas Derby at Oaklawn Park. Multiple stakes victor Gray Attempt is a candidate for the Arkansas Derby if he exits Oaklawn Park’s six-furlong Gazebo Stakes on March 23 in good order. Nolo Contesto, who beat Rebel Stakes division winner Omaha Beach in January, is likely to start in Santa Anita’s Grade 1 Santa Anita Derby on April 6 if a March 23 workout goes as planned. If 58-year-old jockey Jon Court rides Rebel Stakes division winner Long Range Toddy in the Grade 1 Kentucky Derby, he’ll become the oldest jockey to ever ride in the race. Omaha Beach (right forefront) edges Game Winner in the second division of the Rebel Stakes (photo via Oaklawn Park). Long Range Toddy, who took the first division of the split Grade 2 Rebel Stakes at Oaklawn Park over previously undefeated Improbable, came out of his March 16 effort in good order and will be pointed to that track’s Grade 1 Arkansas Derby on April 13. Omaha Beach, who nosed out previously unbeaten Grade 1 Breeders’ Cup Juvenile champ Game Winner in the second division of the Rebel Stakes, will be flown back to California on March 19, and Richard Mandella will evaluate his trainee before committing to a final prep for the Grade 1 Kentucky Derby. Game Winner and Improbable will join Omaha Beach on the California-bound flight, with the latter expected to return for the Arkansas Derby. Conditioner Bob Baffert said Game Winner will be aimed at the Grade 1 Santa Anita Derby on April 6 at Santa Anita Park for his final prep before running for the roses. Alwaysmining, who romped in Laurel Park’s March 16 Private Terms Stakes for his fourth straight stakes victory, is under consideration for Keeneland’s Grade 2 Blue Grass Stakes on April 6. 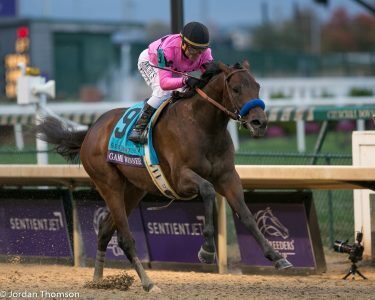 Baffert’s Grade 3 Gotham Stakes fourth-place finisher Much Better will remain in New York in trainer John Terranova’s barn and be nominated to both the Grade 2 Wood Memorial at Aqueduct on April 6 and the Grade 3 Bay Shore Stakes on that undercard. Baffert’s Mucho Gusto was installed as the 8-5 morning line favorite after drawing the rail in a field of 10 for the March 24 Grade 3 Sunland Derby at Sunland Park. Smarty Jones Stakes hero Gray Attempt will turn back in distance for the six-furlong Gazebo Stakes on March 23 at Oaklawn Park. Also pointing for the Gazebo Stakes is Six Shooter, the fourth-place runner in both the Smarty Jones and Southwest stakes. With Irad Ortiz, Jr. committed to Bourbon War for Gulfstream Park’s Grade 1 Florida Derby on March 30, Luis Saez has picked up the mount on undefeated former claimer Maximum Security. Durkin’s Call, winner of the March 17 Gander Stakes for New York-bred 3-year-olds at Aqueduct in his first start for conditioner Bill Mott after a private purchase, could be made a late nominee to the Triple Crown by the April 1 deadline and start next in the Wood Memorial. Grade 3 Swale Stakes hero Call Paul is targeting the Bay Shore Stakes and will continue sprinting. Game Winner takes the 2018 Breeders’ Cup Juvenile (photo by Jordan Thomson). Tacitus exited his Grade 2 Tampa Bay Derby score in good shape, and Hall of Fame trainer Bill Mott says his charge is under consideration for the Grade 2 Wood Memorial at Aqueduct on April 6, the Grade 2 Blue Grass Stakes at Keeneland on the same day and the Grade 1 Arkansas Derby at Oaklawn Park one week later. Conditioner Todd Pletcher reported that Tampa Bay Derby runner-up Outshine came out of his effort fine and will be pointed to the Wood Memorial. Win Win Win, who finished third in the Tampa Bay Derby as the 7-5 favorite, shipped back to his home base in Maryland after the race and is likely to run next in the Wood Memorial or Blue Grass Stakes. Mark Casse-trained Tampa Bay Derby also-rans Sir Winston (5th) and Dream Maker (10th) are targeting a rematch in the Blue Grass Stakes, with the latter to add blinkers. Admire, who was beaten four and a quarter lengths when 7th in the Tampa Bay Derby, will get another chance to earn a spot in the Grade 1 Kentucky Derby gate, most likely in the Blue Grass Stakes. Haikal, who captured Aqueduct’s Grade 3 Gotham Stakes, will stay in New York and have his final Kentucky Derby prep in the Wood Memorial. Gotham Stakes second-place finisher Mind Control is also slated for a return in the Wood Memorial. If Mind Control does start in the Wood Memorial, the purse will be raised to $1 million from $750,000 under NYRA’s previously announced provision regarding a Grade 1 winner participating in the race. Gotham Stakes show finisher Instagrand will head back to trainer Jerry Hollendorfer’s barn in Southern California on March 12, and a decision will be made on his next start after the colt resumes training. Somelikeithotbrown, an easy winner of Turfway Park’s Jeff Ruby Steaks, came out of the race well and will remain at that track while his connections consider all options for his final Kentucky Derby prep. An additional consideration for the New York-bred Somelikeithotbrown is NYRA’s new Turf Triple Series for grass horses beginning in July. Hawaiian Noises, who took the Animal Kingdom Stakes on the Jeff Ruby undercard, is being aimed at Keeneland’s Grade 3 Lexington Stakes on April 13. Rushaway Stakes winner Onthewaytonevrland is also targeting a return at Keeneland, with the grassy Grade 3 Transylvania Stakes on April 5 serving as a possible prep for Royal Ascot’s Commonwealth Stakes. With Santa Anita’s official cancellation of this year’s Grade 2 San Felipe Stakes, Oaklawn Park’s March 16 Grade 2 Rebel Stakes is now probable to be split into two divisions. Oaklawn management announced that if the Rebel Stakes is split, horses from the same trainer would be put in different divisions. Hall of Famer Bob Baffert confirmed that his two planned San Felipe runners, Game Winner and Improbable, will reroute to the Rebel Stakes. Other Southern California-based horses now expected to ship for the Rebel Stakes are Easy Shot, Extra Hope, Galilean, Gunmetal Gray and Omaha Beach. Grade 3 Withers Stakes third-place finisher Our Braintrust, who has been working at the Casse Training Center in Ocala since that race, will travel to Oaklawn for the Rebel Stakes. Keith Desormeaux trainee Sueno will miss the Rebel Stakes after developing a quarter crack. After conferring with breeder/owner Catherine Adams Hutt, trainer Ron Moquett said Frosted Ice needs additional training time and will not make his seasonal debut in the Rebel Stakes. Among options for Frosted Ice are the Arkansas Derby and the inaugural Oaklawn Invitational on May 4, which offers a free berth to the Grade 1 Preakness Stakes at Pimlico on May 18. Multiple stakes victor Alwaysmining remained on target for a scheduled start in Laurel Park’s March 16 Private Terms Stakes following his March 9 breeze. Joevia, second last out to Haikal in the Jimmy Winkfield Stakes, is expected to challenge Alwaysmining in the Private Terms Stakes. Grade 3 Robert B. Lewis Stakes hero Mucho Gusto will make his next start in Sunland Park’s Grade 3 Sunland Derby on March 24. Hoffa’s Union, recently transferred to Mark Casse’s barn after a private purchase, will be prepared for Gulfstream Park’s March 30 Grade 1 Florida Derby at his conditioner’s base in Ocala. Recent Gulfstream Park winners Maximum Security and Final Jeopardy are both under consideration for the Florida Derby, with trainer Jason Servis preferring to keep them separated in the final round of Kentucky Derby preps. Grade 2 Fountain of Youth Stakes champ Code of Honor exited his victory in good shape and is likely to stay at Gulfstream Park for the Grade 1 Florida Derby on March 30, with the Grade 2 Wood Memorial Stakes at Aqueduct one week later also an option. The Florida Derby is also the preferred final Grade 1 Kentucky Derby prep for Fountain of Youth runner-up Bourbon War and show finisher, Vekoma. Hidden Scroll, fourth as the beaten favorite in the Fountain of Youth after setting a wicked pace, remains under consideration for the Florida Derby, as well as the Wood Memorial and Grade 2 Blue Grass at Keeneland on April 6. Fountain of Youth fifth-place runner Global Campaign grabbed a quarter in the race and is off the Kentucky Derby trail while that heals. Signalman, who lost a shoe during his seventh-place run in the Fountain of Youth and didn’t scope cleanly after the race, will be pointed to the Blue Grass Stakes. Probable starters for the Grade 2 Tampa Bay Derby on March 9 at Tampa Bay Downs are Admire, Current, Dream Maker, Lord Dragon, Sir Winston, Tacitus, The Right Path, Well Defined, Win Win Win and Zenden. Multiple Canadian stakes victor Avie’s Flatter will bypass a planned run in the Tampa Bay Derby and be pointed to another spot. Juvenile Champion Game Winner is expected to face stablemate Improbable, Gunmetal Gray, Extra Hope, Easy Shot and, possibly, Nolo Contesto in Santa Anita’s Grade 2 San Felipe Stakes. Trainer Richard Mandella will skip the San Felipe with recent Santa Anita maiden winner Omaha Beach and instead run him in Oaklawn Park’s Grade 2 Rebel Stakes a week later if a quarter crack heals in time for that race. Probable starters for the March 9 Grade 3 Gotham Stakes at Aqueduct include Call Paul, Haikal, Instagrand, Knicks Go, Mind Control, Much Better, Not That Brady, Overdeliver and Tikhvin Flew. Federal Case, who had been under consideration for the Gotham Stakes, will run next in Gulfstream Park’s Grade 3 Hutcheson Stakes on March 23. Horses considered probable for Turfway Park’s Grade 3 Jeff Ruby Steaks on March 9 are Baytown Jimbo, Counter Offer, Curlin Grey, Dabo, Dynamic Racer, Five Star General, Moonster, Skywire, Somelikeithotbrown, Speed App and Twelfofneverland. Country House, runner-up in the Grade 2 Risen Star Stakes, will return to Fair Grounds for the Grade 2 Louisiana Derby on March 23. Derma Louvre, the points leader among Triple Crown nominees in the Japanese prep races, is targeting the May 4 Kentucky Derby and expected to ship to Churchill Downs if all goes in his final prep in the March 30 Group 2 UAE Derby at Meydan Racecourse in Dubai. Conditioner Bob Baffert will target Santa Anita’s Grade 1 Santa Anita Derby with Roadster, who captured his seasonal debut there in a March 1 allowance optional claiming event. Ken McPeek trainee Lemniscate, who took a Gulfstream Park maiden special weight turf contest on March 3, is a candidate for Oaklawn Park’s Grade 1 Arkansas Derby on April 13. 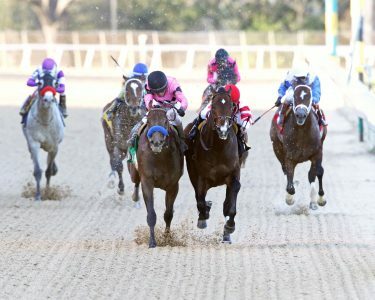 Gray Attempt, winner of Oaklawn Park’s Smarty Jones Stakes in January, will miss the Rebel Stakes due to a minor setback, but his connections remain hopeful that the colt can make the Arkansas Derby. Conditioner Bill Mott said that Mucho, who returned from a lengthy layoff to win a six-furlong allowance on March 1 at Gulfstream, will remain around one turn for now and make his next start in the Grade 3 Bay Shore Stakes at Aqueduct on the Wood Memorial undercard. Oaklawn Park’s Grade 3 Southwest Stakes hero Grade Super Steed is off the Kentucky Derby trail due to bone bruising in a front leg and will need 60 to 90 days of recovery. Courtyard, who scored in a Fair Grounds allowance optional claiming contest on March 2, exited the race with a minor issue and should return in the summer for trainer Tom Amoss.